¶ 1 Leave a comment on paragraph 1 0 The founding members of the APA were not isolated from the transitions of American business and leisure life near the end of the nineteenth century. Robert Wiebe’s influential work, The Search for Order, detailed the breakdown of local autonomy in small “island communities” beginning in the 1870s as hierarchical needs of industrial life took hold in the United States.1 In a similar way, the APA sought to join island communities of stamp collectors to form an infrastructure that supported and nationalized the hobby. The founders believed the adage, “in union there is strength,” applied to stamp collecting communities. Bringing national recognition to the hobby, the APA promised to promote philately “as worthy and rational” because “it should be regarded in the same light as are the generally recognized specialties that have worked their way from obscurity to the positions they now apply.”2 Signifying similarities with newly-forming professional associations, these founding members suggested stamp collecting could emerge from obscurity with a formal organization leading the way. By establishing a society of like-minded individuals, philatelists hoped to spread the word about stamp collecting to a national audience. ¶ 2 Leave a comment on paragraph 2 0 On September 14, 1886 the APA held their first meeting to draw up by-laws and a constitution, elect officers, and establish membership and affiliation rules. The small group chose John K. Tiffany, an attorney from St. Louis, Missouri, to be the APA’s first president. By-laws detailed best practices for obtaining stamps and discouraged counterfeiting. According to the preamble of their constitution, the APA would help members learn more about philately, cultivate friendship among philatelists, and encourage an international bond with “similar societies” in other countries.3 Philately had a strong international component for all collectors, since most collected and studied stamps printed in countries different from their own. 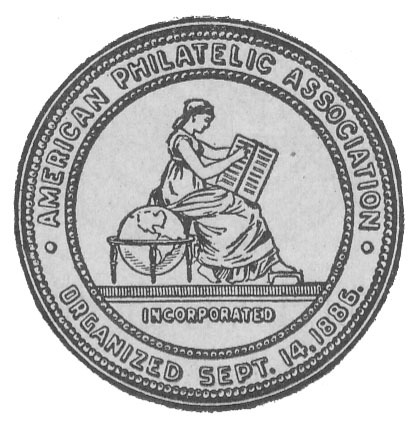 Additionally, the APA believed that connecting with groups outside of the U.S. would raise the stature of this association and make the APA the premiere national philatelic organization. The overall mission of the APA sought to legitimize and publicize the practice of stamp collecting. ¶ 3 Leave a comment on paragraph 3 0 Less concerned, rhetorically, with excluding unaffiliated stamp collectors, APA’s constitution encouraged people to join. Technically, “any stamp collector” could apply to the Secretary of APA for membership. Current members considered a candidate’s background for one month before voting to accept or reject petitioners. This procedure was in place to ensure no known counterfeiters applied. Yet if a candidate was not sponsored by another member, chances were high that the application for membership would be denied. This practice mimicked how other exclusive social clubs operated in an attempt to keep out undesirables, namely women and people of color. For an annual fee of $2.00, APA members received the American Philatelist journal, gained access to the APA library, and enjoyed the community of collectors for buying and trading varieties. While embracing all stamp collectors, the APA firmly and publicly rejected those dealing in or making counterfeit stamps.4 By denying membership to known counterfeiters, the APA reassured their members that the stamps they dealt or traded were government-issued stamps. ¶ 4 Leave a comment on paragraph 4 0 While partaking in social gatherings was one aspect of club life, leadership in the APA encouraged a serious study of stamps as part of membership. The second president, Charles Karuth, asked members in 1899 what the APA had done for the “advancement of the science of philately?” Karuth saw its membership comprising mostly of collectors and not philatelists as he carefully distinguished between the “mere amassment of stamps” and the study of philately. So as not to be viewed as “stamp cranks” and to distance themselves from schoolboys who swapped stamps, Karuth encouraged APA members to engage in the valuable and scientific side of philately. If they did this, he believed that philatelists would be “recognized as gentlemen who had chosen a valuable branch of study.”5 Karuth’s plea illustrated how the APA sometimes functioned like a professional association as it distinguished between professionals and amateurs. At the same time, Karuth’s comments also demonstrated a growing tension among club philatelists who wanted to encourage more individuals to collect stamps, but only to do so within strictures established by clubs. ¶ 7 Leave a comment on paragraph 7 0 Similar to female figures incorporated into other seals and artworks, Philatelia represented the ideals of the APA. Personified representations of America and Columbia, as well as other ideals and virtues, took female forms with which some Americans were no doubt familiar. 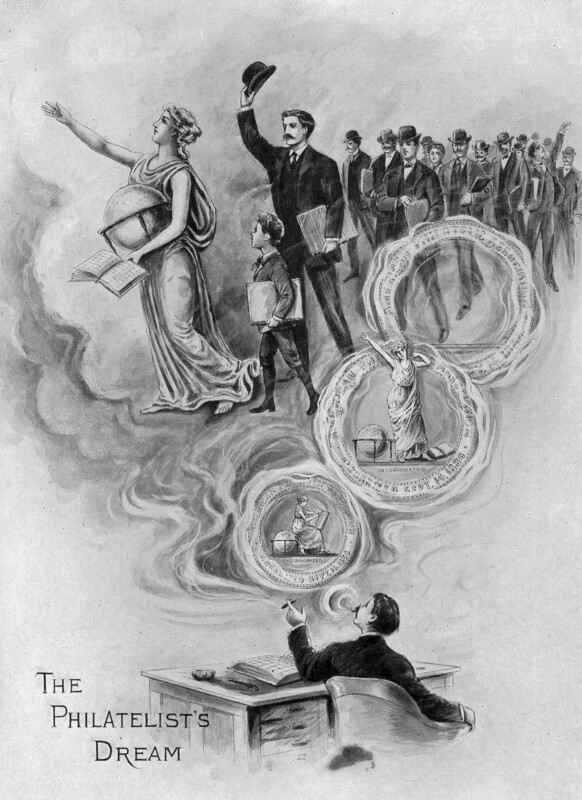 Iconography similar to Philatelia appeared on public murals in the 1890s, with painted women representing Justice, Patriotism, and the disciplines of science in the Library of Congress. Imagery represented a real political and cultural conflict because some of the principles personified by women were not legally available to them at the turn of the century, including rights to participate in democracy, to make economic choices, and to be protected equally under the law. Similar to these female mural icons, Philatelia celebrated activities that took place predominantly in a male world and was beloved by those men.7 We know that women collected stamps privately but were not welcomed in most philatelic clubs. Philatelia, like other female idyllic icons, had limited symbolic powers to represent equality for American women at the turn of the century. ¶ 9 Leave a comment on paragraph 9 0 With some club names sounding like a fraternal organization, many male collectors believed that philately was in fact a brotherhood—even transforming them into a brotherhood of Renaissance men. Knowledgeable in many subjects, including history, astronomy, geography, and languages, philatelists portrayed themselves as cosmopolitan men of the world. “We Collectors are brothers, comrades, citizens of a great, progressing, ever-widening Brotherhood.”9 This concept of brotherhood was no doubt grounded in ideas learned from experience with fraternal organizations and dinner clubs, and perhaps in saloons, where men socialized in their leisure time. Philatelic club kinship was referred to as “a Freemasonry among Stamp Collectors,” where a fellow collector was “always warmly welcomed.”10Likening the bonds formed to Freemasonry solidified philatelic clubs—in their minds—as a white male-only domain, while participation in the hobby was not. ¶ 11 Leave a comment on paragraph 11 0 These clubs were not welcoming for people of color, either. Surprisingly, as African Americans established fraternal, religious, and social clubs on their own terms, stamp collecting appears to be almost absent from their leisure time clubs.12 And yet, an African American publisher, who later became the Assistant Registrar to the US Treasury, re-constituted the Washington Philatelic Society (WPS) in 1905 together with white Washingtonians and became the club’s first president. Cyrus Field Adams was a well-known businessman as editor and publisher of The Appeal who used his position at the paper and in various advocacy organizations to argue for political and economic rights of African Americans. He also loved to collect stamps and amassed a collection over 6,000 when he served as the Washington Philatelic Society president. His presence in a white-dominated, “exclusive” club displeased some philatelists from other societies. Rumors were generated that spread through African American newspapers, and even in the New York Times, that Mr. Adams was passing as white and in his position denied another African American philatelist membership in the WPS. Adams had in fact voted for the applicant whose membership was denied by a majority of the other members.13 The comics and jokes printed in philatelic magazines remind us that while philatelists were uniquely engaged within their hobby’s community, they were not isolated from broader American social and cultural behaviors and discourse where racial stereotyping and racism was common. ¶ 12 Leave a comment on paragraph 12 0 As philatelic societies grew and established their membership criteria, they also carved out identities for their organizations and collectors. From its beginnings, the APA set forth to build a strong national philatelic organization in the U.S. designed to compete with British and continental European nations that had already formed their own national philatelic clubs.14 To be on par with other national association, the APA articulated a vision in a few key ways. ¶ 13 Leave a comment on paragraph 13 0 First, the APA’s desire to lead in philatelic pursuits came in the form of actual vision. , “The Philatelist’s Dream,” an illustration printed in 1906 demonstrated how the APA could be a leading stamp society in the world.15 In the “Dream,” a vision emerges from a philatelist’s cigar smoke rings while he sits at his desk with his stamp album open. The first smoke ring approximates the APA’s seal with Philatelia sitting on a globe studying her album. In the next ring, Philatelia turns towards the viewer with her album on the floor, and stretches as if she has awoken from a dream. The third ring is empty, as if Philatelia left the APA’s seal. She appears above the three rings holding the globe and stamp album in her arms as she extends her right arm in an action of leadership and movement. Boys, men, and at least one woman follow the APA’s Philatelia as she leads them west across the image. 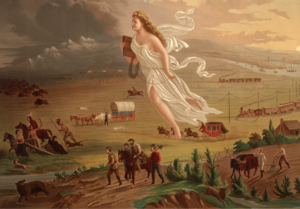 ¶ 15 Leave a comment on paragraph 15 0 The APA’s image represents a striking similarity to late-nineteenth century art representing American destiny and progress, as the APA envisioned itself as a leader in the philatelic world. The “Philatelist’s Dream” is reminiscent of the 1872 painting “American Progress,” by John Gast that was distributed widely and sold in lithograph form. ¶ 17 Leave a comment on paragraph 17 0 The female figure wears the “Star of Empire” and floats above people leading them and approving of their westward movement as settlers from the east proceed west across the painting. Settlers push out herds of buffalo and Native Americans, with trains, stage coaches, and ships bringing more settlers to complete the conquering of peoples and lands. The female figure carries a book in hand, not unlike Philatelia’s album, symbolizing knowledge and learning. This awakening of the APA’s Philatelia suggests that club philatelists internalized a vision of America as a unique place with a distinctive history, extending that exceptionalism to their philatelic association. Through this imagery we see that some club philatelists equated studying and collecting stamps with the cultural of imperialism. As the U.S continued to conquer North America and islands in the Pacific and Caribbean, American stamp collectors became leaders in conquering the world in their philatelic knowledge and also in the ways that they amassed nations, stamp by stamp. ¶ 18 Leave a comment on paragraph 18 0 The second part of the APA’s exceptionalist vision included an organizational theme song first presented at the 1906 annual meeting. ¶ 25 Leave a comment on paragraph 25 0 Similar to the “Dream”, these lyrics demonstrated that members enthusiastically believed that the APA’s would provide a leading example in the international philatelic world and amply represented the “big and strong” United States. This organization of white male philatelists paired evenly with American foreign policy that constructed a narrative of masculine progress and “manifest” destiny that justified occupations and invasions of sovereign nations.17 Rhetorically, the APA constructed itself to be as strong, and perhaps as masculine, as the United States had become in the geopolitical landscape. The lyrics call out to the world’s philatelists to notice the APA’s strength that comes from its members—“great and small,” “representing every state.” For its members, the APA stands as the “ever-guiding star,” which is almost equivalent to Gast’s “Star of Empire,” leading philatelists to gain new philatelic knowledge, and also to become a leader in philately. Much like the “Dream,” the lyrics indicate how APA members internalized the idea of American exceptionalism—of the U.S. as a nation and with regard to APA. The APA certainly was not the only club with members hailing from all states, but its members believed it stood for ideals of America that those trading and collecting stamps in marts in Europe and Asia recognized the APA’s strength as an organization. ¶ 26 Leave a comment on paragraph 26 0 The “Philatelist’s Dream” and theme song added to a grand vision the APA’s members held for its organization as it expanded and faced competition from other organizations. The last components of this vision came in 1908 when the APA changed its name to the American Philatelic Society (APS) and increased the frequency of publishing its journal. The name change made the APS sound similar to the well-established Royal Philatelic Society, and possibly distanced itself from professional associations that it initially mimicked. The APS started publishing its journal, American Philatelist, quarterly rather than yearly, and American Philatelist began soliciting and printing articles that focused on the study and history of stamps rather than merely publishing the minutes and speeches from the annual conventions. Members were constantly encouraged to recruit acquaintances, and membership nearly tripled from 574 in 1895 to over 1500 in 1908.18 As many other stamp clubs formed, the APS relied on its members to help connect smaller clubs to the APS through affiliations. The network of philatelic clubs grew across the US together with an active philatelic press that spread the word about stamp collecting to interested readers while simultaneously recruiting new members.